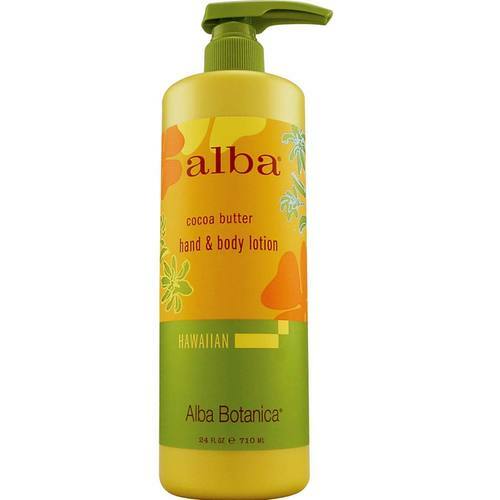 Cocoa Butter Hand & Body Lotion from Alba Botanica, containing cocoa butter and Vitamin E, nourishes the body all over. Cocoa butter is one of the best ingredients there is for skin therapy. If you have dry skin, Cocoa Butter Hand & Body Lotion is perfect for you since dehydrated skin is relieved as it is moisturized and nourished. This product on the Alba Hawaiian line is gentle for all skin types. This product is hypo-allergenic and pH balanced. It is made with 100% vegetarian ingredients and without any animal testing. It also is compliant with the EU Cosmetics Directive. It is also paraben-free. Apply daily over entire body. Soothing for hands, reapply after washing.